OAKLAND, Calif. (AP) Steve Kerr has long known he has an All-Star cast. Golden State’s backups gave him another glimpse Wednesday night. When three of the Warriors‘ four headliners were down injured, the role players rallied together. 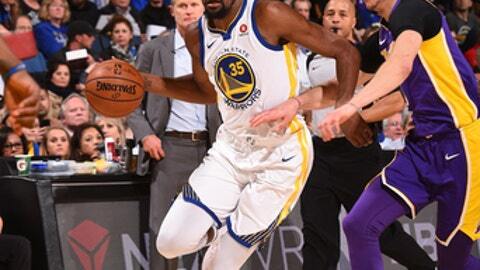 Kevin Durant scored 26 points and the injury-plagued Warriors pulled away in the fourth quarter to beat the Los Angeles Lakers 117-106 while missing Stephen Curry on his 30th birthday and their two other All-Stars. Zaza Pachulia returned to the starting lineup for the first time since the All-Star break and had 10 points, 12 rebounds and five assists for the banged-up defending champions, who already had clinched a sixth straight playoff berth this week without playing. Kerr’s non-traditional, late-season starting lineup of Durant, Cook, Nick Young, Kevon Looney and Pachulia worked as the Warriors won their eighth straight home game. Young scored 18 points and had three of the Warriors’ six 3s. Durant, who had averaged 38.7 points over his previous three games, shot 10 for 19 but missed six of his seven 3-point tries. He added six assists and five rebounds. Looney matched his career high with 11 points for Golden State, which had lost a rare two in a row. Julius Randle had 22 points and 10 rebounds before fouling out late as the Lakers were without starting forward Kyle Kuzma because of a sprained right ankle. Los Angeles had won two straight and three of four. Isaiah Thomas added 20 points with five 3-poitners and seven assists, while Lonzo Ball dished out 11 assists. Curry sat for a third straight game after re-injuring his troublesome right ankle early in a March 8 win over the Spurs. He and Splash Brother Klay Thompson are both out for at least a four-game stretch and scheduled to be re-evaluated next week. Thompson has a fractured right thumb that will sideline him until March 22. Ball’s follow shot at the halftime buzzer after an off-balance missed 3 by Kentavious Caldwell-Pope sent the game into intermission tied at 55. Golden State then opened the third on a 21-7 run and made seven of its first eight shots without any points from Durant. Omri Casspi scored 15 points off the bench and Shaun Livingston 13 as the Warriors earned a seventh straight victory against the Lakers – Golden State’s longest unbeaten run in the series – and 11th in a row in the series at Oracle Arena. Lakers: Kuzma tried to get ready for the game. ”He came over earlier and tried to push through it a little bit, and he couldn’t,” coach Luke Walton said. ”It isn’t really worth it. He’ll be out tonight and get treatment tomorrow. We’ll take it day-by-day.” … Walton’s Hall of Fame father, Bill, was on hand and son said: ”Big Bill’s here. He’s always been a great support.” … Los Angeles hasn’t won in Oakland since an OT victory Dec. 22, 2012. … The Lakers shot 12 for 37 from deep. Warriors: On the bench, Curry was shown on the big screen late in the second quarter and wished a Happy Birthday. … Thompson had played in 530 of a possible 543 regular-season games. … Pachulia made his first start since the All-Star break after JaVale McGee had been playing in his place. … The Warriors also reached the playoffs in six straight years from 1946-47 through 1951-52 while in Philadelphia. Draymond Green was also out Wednesday with soreness in his right shoulder. Backup center David West was sidelined for a fifth consecutive game with a cyst in his right arm but could return as soon as Friday. Rookie Chris Boucher was up from the G League Warriors and made his NBA debut with 1:19 left. With so many down, Kerr wanted his healthy players to be loose and let it fly. ”With Klay and Steph out, what’s that, about 75 shots that are not going to be available on most nights that are suddenly there?” he said. Lakers: Host Miami on Friday. Warriors: Host Kings on Friday.